Zen Ken Ren Iaido and Zen Ken Ren Jodo are both taught at Bujutsu Martial Arts Centre. Both are legitimate arts that originate from Japan and are recognised internationally. Jodo, the way of the stick is a staff art. Iaido is a pattern based sword art. 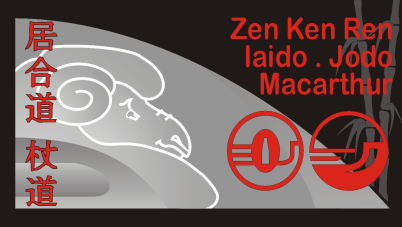 Zen Ken Ren Iaido and Zen Ken Ren Jodo Dan grades are registered in Tokyo, Japan and are internationally recognised grades. The Zen Nihon Kendo Renmei is the official international organization which exercises general control over and representing Kendo, Iaido and Jodo. It was established by the Japanese government after World War II. The Australian Kendo Renmei and the NSW Kendo Association are the Australian state and national bodies affiliated with the Zen Nihon Kendo Renmei through the International Kendo Federation.